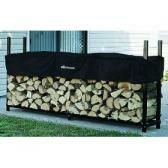 The Panacea 15206 adjustable length firewood log rack is an easy to assemble log rack suitable for indoor or outdoor storage. It’s basically a rack with two metal end pieces connected by two pieces of 2X4 of invariable lengths at the base. The rack is easy to assemble and requires only two screws for each end. The added advantage of the adjustable length rack compared to other log racks is that you can adjust the length of this rack according to what is suitable for the space it will occupy. 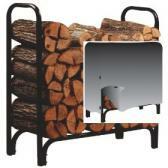 The best place to get firewood rack is from Amazon. They currently offer an amazing deal with the lowest price I could find anywhere. Also their customer service is top of the line and the shipping was super-fast and free. 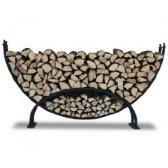 They currently have over 17 reviews from many different users so you can see just how happy people are with this Panacea Firewood Log Rack. There’s no need to assemble the ends separately before you can put the rack together. They’re ready for assembly soon as you open the box. The material for the end pieces is powder coated lightweight yet sturdy metal which is why it can withstand a lot of weight and weathering. All units are painted in black. The end pieces are made with precision such that 2X4 pieces easily fit the slots. There’s no need to shave off the ends of any 2X4s to make it fit, making assembly possible in as little as three easy steps. Buy from Amazon and Save 27% for Limit Time Only! The width or depth of the rack is 11 inches. It works well with pieces of firewood with length averaging 18 inches. The rack remains stable regardless of the weight placed on it. The planks at the base may need added support should you choose to elevate the rack from the ground. Depending on the length and quality of the planks you will use, add an extra support or two between the two ends and space all of the support equally apart. 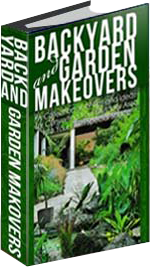 Marble slabs, cinder blocks, bricks or other sturdy construction materials may be used. Elevating the firewood rack from the ground is recommended if you want to prolong the life of the planks at the base and keep them dry. It’s also recommended that you use new 2X4 planks instead of ones found used in houses about 30 or 40 years old. The older planks are usually 1/8 inch thicker and will need to be shaved a bit before they can fit the slots at the ends. The price of the Panacea Adjustable Length Log Rack is comparably cheaper than most log racks that are not even adjustable. The only difference is that the non-adjustable ones have raised shelving so the logs stay dry and the Panacea model is actually a lot more flexible. The width and length of the Panacea model is variable so it is OK however the height is only 44 inches which makes it 4 inches short for a rick of firewood, assuming you use full length pieces of 2X4. What does make it better than most racks is that you can maximize the length to about 8 feet whereas other firewood racks average at a fixed length of 7 feet 3 inches with only a height difference of an inch. 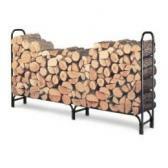 The Panacea 15206 Firewood Log Rack currently has a very high rating of 4.5 stars out of 5 stars, which is unbelievably high. 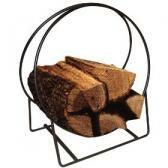 There are many great things being said about this firewood rack and here is a few things people have said about it. Click here to read more reviews. 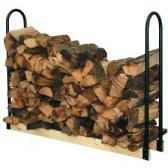 How would you rate the "Panacea Adjustable Length Firewood Log Rack"?